You cannot log in to myfritz.net or the MyFRITZ! home page of your FRITZ!Box. After you enter your account information, the error message "Login failed" or "Invalid user name or password" is displayed. First you log in to your MyFRITZ! account on the myfritz.net website; to do so, you must enter your email address and personal MyFRITZ! password. This login information is saved in encrypted form on our MyFRITZ! servers when you create the MyFRITZ! account and verified when you log in with myfritz.net. Then myfritz.net redirects you to your own FRITZ!Box. After being automatically redirected to the MyFRITZ! 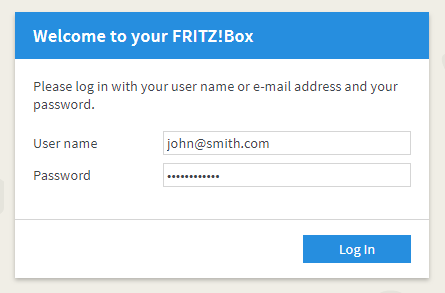 home page of your FRITZ!Box, you then have to log in to your FRITZ!Box itself. For this purpose, your FRITZ!Box has its own user administration that is completely independent of MyFRITZ!. User names and passwords of FRITZ!Box users are not known to the MyFRITZ! service or AVM; instead, they are stored exclusively in the FRITZ!Box and verified during login with this FRITZ!Box. Depending on whether you are unable to log in to the MyFRITZ! service or your FRITZ!Box, follow the instructions in the corresponding section. In the "Enter email address" field, enter the email address you used when registering your MyFRITZ! account. This is the email address displayed under "Internet > MyFRITZ! account" in the FRITZ!Box user interface. In the "Enter MyFRITZ! password" field, enter the password you set for the MyFRITZ! account. In the corresponding fields, enter the user name or the email address and password of a FRITZ!Box user who is authorized to access the FRITZ!Box from the internet.